Here’s the latest notification of Pakistan Army to Join Pakistan Army as Commissioned Officer Through 37th Graduate Course. Registrations are open from 19th June 2017 till the last date of 19th July 2017. Here’s the latest notification of Pakistan Army to Join Pakistan Army as Commissioned Officer Through 37th Graduate Course. A great opportunity for young and talented to serve the nation in Pakistan Army. The training duration of the graduate course is only one year. Registrations are open from 19th June 2017 till the last date of 19th July 2017. 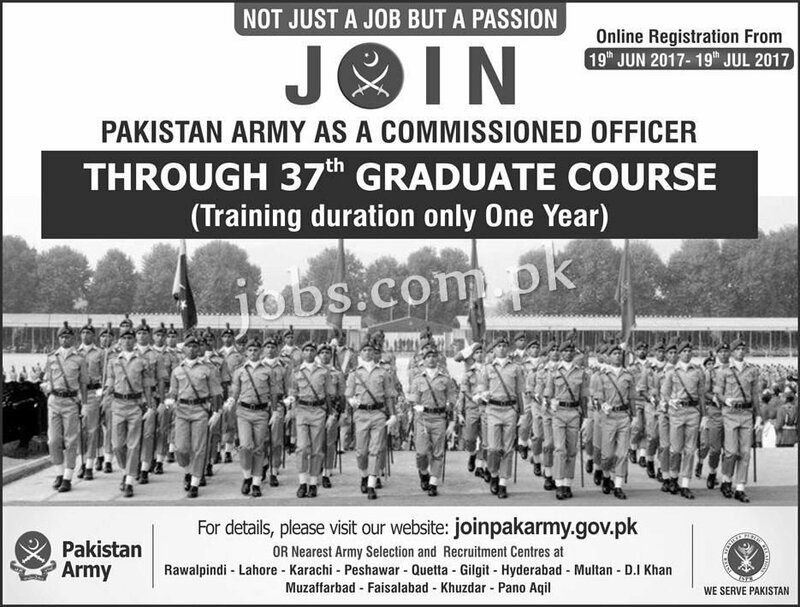 In case the official website of joinpakarmy.gov.pk is not accessible, please visit nearest Army Recruitment Center in your city. A complete list of all cities are given here.